The second largest holiday resort in Lake Tahoe receives over 600,000 visitors annually and is regarded as one of the best ski resorts in the world. Squaw Valley was the site of the 1960 Winter Olympics (the first televised Winter Olympics) and has attracted millions of holiday visitors to its varied terrain. Nowadays the resort is packed with several accommodation options, restaurants, bars, entertainment venues and shops while still retaining its unspoilt, quintessentially Californian character. The resort attracts a mixed international crowd and is suitable for skiers of all abilities. At 9050 feet (2760m) above sea level and spread across six peaks and 4000 acres of terrain, there are enough runs for every level of skier and snowboarder at the resort. In total there are 112 different runs totalling 485 miles (782km). Unusually Squaw Valley does not mark trails on its piste map relying instead on a graded lift markings. Squaw Valley attracts plenty of expert skiers drawn to the cliffs and chutes rivalling some of the best found across the continent. Squaw Valley also offers the best nightskiing in Tahoe. Skiing and snowboarding needs will be taken care of in shops that include Squaw Valley Outfitters and The North Face. There are other smaller grocery stores offering enough for all self catering needs and several other novelty stores include Black Diamond Wine Exchange, Waxen Moon and Double Diamond Jewellery, selling liquor, candles and shiny stones. Granite Chief ski shop can handle all tuning and waxing needs. 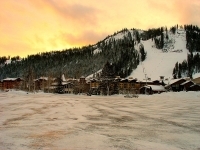 Megalithic shopping mall, The Village At Squaw Valley, will cover all your remaining shopping needs. There are any number of restaurants to suit just about all visitors' tastes and budgets at Squaw Valley. Graham's at Squaw Valley remains an outstanding fine dining option while the Fireside Pizza Company serves some of the best pizza in Tahoe. Focusing on Northern Californian cuisine, Six Peaks Grille at Resort at Squaw Creek offers picturesque views, attentive service and a cosy atmosphere. Sandy's Pub serves up hearty comfort food and is the perfect spot for watching sport. Le Chamois & Loft Bar is the place to go for lunch after a morning on the slopes or for an après-ski beer at their legendary bar. Not known for its apres-ski scene, Squaw Valley has a few worthwhile nightspots of the down-to-earth variety. For an authentic local scene check out The Loft Bar and Cornice Cantina. Long-time favourite The Auld Dubliner is a great place to savour a few pints after a hard day on the slopes and was originally a pub built in Ireland until it was dismantled and brought all the way to the US. Ice-skating, snowtubing, wall climbing, dog sledding, or simply relaxing in one of the heated pools and Jacuzzis is bound to keep those needing a break from the skis and snowboards occupied. Squaw Valley can get quite busy over the Christmas and Spring Break periods.